Today we are interviewing Christine Sherborne, author of "Imogene's Message." When extreme religious fundamentalists known as the Phineas Priesthood led by Ezekiel Yates and his three cousins, target Xantara Pembroke because they believe she is a witch, they launch a major conflict between unworldly disciples of good and evil. This 60,000-word, action-packed thriller shows the twists and turns of both sides as they try to destroy or save the souls of earth. 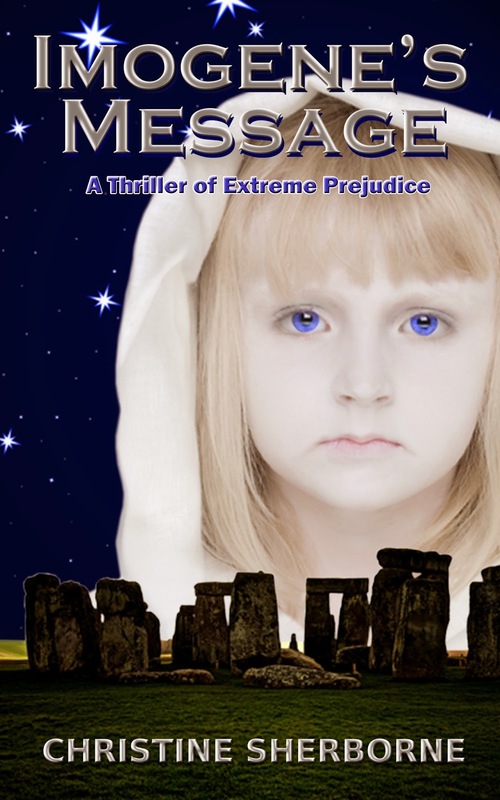 Imogene is the daughter of Xantara, a Guardian of Avebury Circle, an ancient monument near Stonehenge. For over three thousand years, wives of eight village families have performed ceremonies to heal local people, with power handed down from first daughter to first daughter. The Pembroke family encounter extreme prejudice from the Priesthood. Braedon the village doctor is drawn into a world he didn't know existed to protect his daughter. His wife Xantara keeps her secrets and causes conflict in the marriage. All that is forgotten when Imogene levitates in Avebury Circle. Will the world believe Imogene’s incredible message? My interest in spirituality, and the paranormal. Doctor Braeden Pembroke. We see a man who is basically good, gets sidetracked by tragedy, and then realizes what is important. Lady of Hay by Barbara Erskine. I started writing self-help and inspirational books, then last year I decided to try writing a thriller, and found I loved creating my own story. Don McNair, my editor mentored me for nearly a year. I learnt so much from him, and I’m grateful for his patience. Yes, English but also History. I love my Ipad and use it all the time, but still visit my local library. I have finished the second in the Imogene series and will then write the third. I am very much a pantster, so time will tell. I like to feel from feedback I’ve received that my self-help books and blogs have helped many people. Purely the time it takes to complete a book. My ideas flow faster than my writing! I can only write when inspired which is most of the time. On the odd days I can’t write, I catch up on household chores. I use a computer as I touch type and has the advantage of a spell-checker. I’ve thought about another series with a supernatural theme involving an Art Gallery. My book has been professionally edited, which I believe is essential for any writer.